1. First time home buyers get more indebted. The costlier the home, the bigger their mortgage is going to be. First time buyers are usually younger generation which are already debt burdened with student loans, so higher real estate prices aren’t what they need. 2. Closing costs become exponentially bigger. You pay more to your real estate agents. Real estate agents usually charge about 5% commission. In 2002 you would of pay $15,000 in commission for average Toronto house, while in 2012 you would have to pay $27,000. 3. Existing home owners go further into debt. Home owners start behaving irrationally through wealth effect (rising equity in their home) by engaging in extra consumer spending via the practice of mortgage equity withdrawal. While it is true some say this is positive for economy, which it sort of is in the short term, this is a not sustainable growth path as you can’t base countries economy on inflated house prices. Rising housing prices is mainly a function of two things. First is supply and demand. Second is the expectation of future price gains. 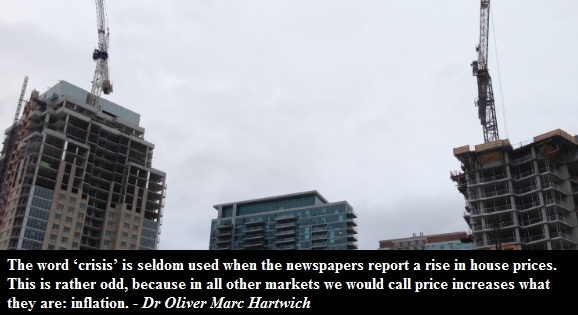 When the population starts believing in ever rising real estate prices, it becomes a self-fulfilling prophecy. Investors start jumping in to the market, in hopes of making a fortune. The fake demand leads to more units being build. This over building leads to boom and bust cycles in construction industry and is a big mis-allocation of capital. On a macro level flipping houses is not a way to prosperity. 5. Vulnerability to interest rates. Rising house prices leave many vulnerable to interest rate hikes. The Bank of Canada estimates that about 10% of Canadian homeowners would not be able to afford higher interest rates. The rich get richer, while the poor get poorer. Rising home prices are good for you if you own a place, but no so good when you rent. For a decade rising housing prices in Canada have outpaced incomes which means that with every passing year renters have to put higher percentage of their income for the down payment as home prices become exponentially more expensive. Even with low interest rates many are still priced out of the market and continue to transfer their money to the top of the pyramid by renting. High real estate prices are a barrier for people moving from one part of the country to another, especially when you are moving to a more expensive city or town.